The global D-amino acid market was valued at around US$ 150.0 Mn in 2017 and is anticipated to expand at a CAGR of more than 5.0% from 2018 to 2026, according to a new report published by Transparency Market Research (TMR) titled ‘D-amino Acid Market – Global Industry Analysis, Size, Share, Growth, Trends, and Forecast, 2018–2026.’ The global D-amino acid market is driven by the rise in demand for the chemical among pharmaceutical manufacturers and processors. Increase in demand for domestic and synthetic peptides in pharmaceutical applications and rise in adoption of D-amino acids in these peptides are likely to drive the global D-amino acid market during the forecast period. The D-amino acid market in Asia Pacific is expected to expand at a CAGR of around 6.0% during the forecast period. Rise in geriatric population, large patient pool, development in the health care sector, and increase in focus on research and developmental activities are factors driving the D-amino acid market in the region. D-amino acids are primarily employed in physiological and medical applications such as neurotransmission and hormonal regulation. D-amino acids are the primary components of domestic & synthetic peptides and peptide-based drugs. They are used in peptide production for synthesizing drugs for the treatment of the Alzheimer's disease and tumors. D-amino based peptides are used in the synthesis of nicotinamide acetylcholine receptors, calcium channels, sodium channels, anti-epilepsy drugs, and endorphin releasing drugs. High prevalence of chronic diseases is anticipated to lead to an increase in production of peptides. Thus, rise in production of peptides from a variety of D-amino acids is projected to boost the global demand for D-amino acids. Increase in demand for D-amino acids in pharmaceutical applications is expected to drive the global D-amino acid market during the forecast period. D-amino acid exhibits a characteristic physiological action that is comparatively different to that of L-amino acids. D-serine is used in the distribution of NMDA receptor channel in the central nervous system. D-serine enhances the NMDA receptor activity by increasing the memory and learning ability of humans. D-alanine is engaged in collagen production promoting action to regulate the blood glucose level in the human body. D-aspartic acid possesses excellent skin-beautifying effects, while D-glutamic acid alleviates wrinkle formation of the skin. D-Histidine has an anti-obesity property that suppresses human appetite. It is used to control body weight and regulate metabolism. D-aspartate helps improve reproductive functions and is used in testosterone production to increase testicular Leydig cells. Rise in usage of D-amino acid in various end-use industries is projected to drive the d-amino acid market during the forecast period. 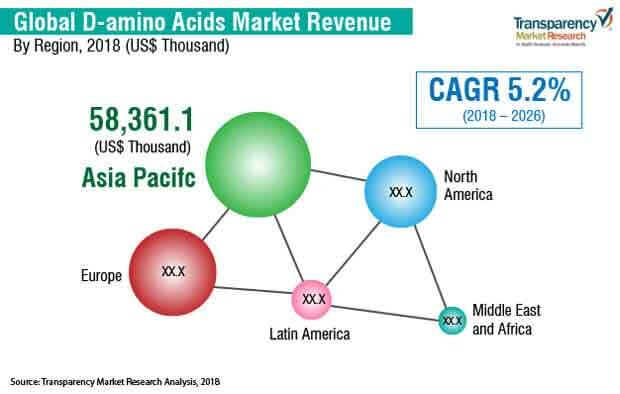 Based on region, the global D-amino acid market can be segregated into North America, Europe, Asia Pacific, Latin America, and Middle East & Africa. In terms of value, Asia Pacific was the leading region of the global D-amino acid market in 2017. China and Japan account for significant share of the D-amino acid market in the region, as these are the major manufacturing and processing hubs for pharmaceutical industries. Health care infrastructure in emerging markets such as ASEAN and India is improving. This is fueling the D-amino acid market in Asia Pacific. Increase in research activities pertaining to D-amino acids in the U.S. is anticipated to boost the demand for D-amino acid in the next few years. The D-amino acid market in Europe is projected to expand at a moderate pace during the forecast period. Key players operating in the D-amino acid market include Evonik Industries AG, Tokyo Chemical Industry Co., Ltd., and YONEYAMA YAKUHIN KOGYO CO., LTD, Central Drug House (P) Ltd., Zhangjiagang Huachang Pharmaceutical Co. Ltd., Sichuan Tongsheng Amino acid Co., Ltd, Sekisui Medical Co. Ltd, Kyowa Hakkon Kirin Co. Ltd, AnaSpec, Inc., and Varsal Chemicals. These players are focusing on strengthening their product portfolio in order to increase their market share.